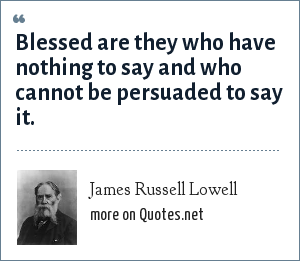 James Russell Lowell: Blessed are they who have nothing to say and who cannot be persuaded to say it. "James Russell Lowell Quotes." Quotes.net. STANDS4 LLC, 2019. Web. 23 Apr. 2019. <https://www.quotes.net/quote/37752>.